Update August, 2013: Stick Shift is a product that implements this on Windows. This post teaches you how to set up your computer so that you can generate any keystroke or key combination without taking your hands off home row (the 'asdf' row of keys). You can then use the arrow keys, page up/down, shortcuts, and more while in regular typing position. It works across applications, allowing you to type and move about much faster. I call it 'home row computing' and it's something I started doing after I learned touch typing. The idea is to change Caps Lock so that it can be combined with other accessible keys to produce all of the faraway keys shown above, plus frequent key combinations and anything else you might want. When I say "map to home row" I mean mapping to keys that can be reached while your hands remain on home row. Nearby letter keys are fine too. For example, Caps Lock+j could become the Up arrow and Caps Lock+e could become Alt+F4. It is common to turn Caps Lock into Control, but we don't actually want that because nearly all Control+X combinations are already taken by various programs, so we wouldn't be able to do much remapping. Some Control+X combinations are very high yield (e.g., the copy/paste/cut combos) so we'll remap those onto home row. I think the best substitute for Caps Lock is the "Apps Key". Since no software uses it as a shortcut ingredient, we can hijack it without fear. Also, its normal role is to open a right-click context menu, so that's a useful thing to have on home row as it helps you stay clear of the mouse. Thanks to AutoHotKey's eliteness the layout works well in practice. The timing is not quirky at all and there are zero misfires. If you hold down Caps Lock, you can press the other keys repeatedly and they'll be remapped. Let go of Caps Lock and they're back to normal. The script also handles modifiers such as Alt and Shift being pressed along with the key combinations. It's pretty transparent. If you want to actually toggle caps lock, then Windows Key + Caps Lock will do the trick. It is a joy to have navigation keys on the home row. It makes browsing, programming and writing much smoother. You can fly through dialogs. Having Esc nearby is not bad either. All in all, I can't imagine going back to a regular keyboard. Given AutoHotKey's power you can write scripts to handle key combinations so there are many possibilities. I adapted to this thing pretty fast; the symmetries between page up/up arrow, home/left and so on helped a bit. Again, it's trivial to pick your own bindings, take a look at other ideas for cursor movement and cook up your own scheme if you wish. Some quick thoughts regarding text editors. When I first did this I was an Emacs user so having a convenient Control key was crucial, but I still think it's better to turn Caps Lock into the Apps Key instead. 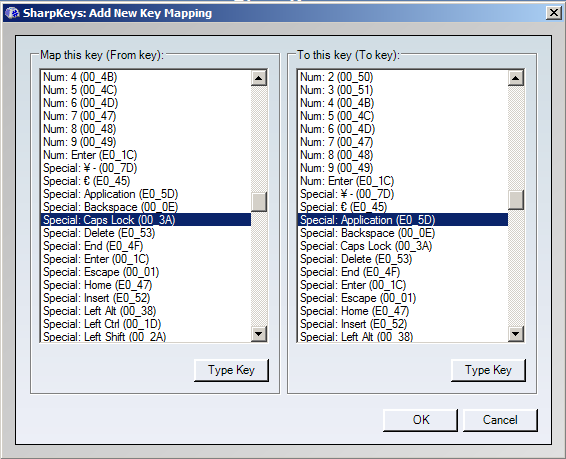 Then you can pick and choose your macro bindings between Control and Caps Lock, and given AutoHotKey's power you have a lot of leeway. I have since switched to Vim (apostasy!!) and never looked back. Vim users will recognize the beauty of having arrow keys on the home row, but will probably barf at the exact key choices I used since jklh is burned into their brains. Just edit the script. You'll like navigating without switching modes, and Esc on the home row is great for when you do switch. In Visual Studio this works seamlessly without interfering with any of the native shortcuts. I've tried this out on Windows XP, Server 2003, Vista, and Server 2008, both 32- and 64-bit flavors. No problems that I know of, but use it at your own risk. The script works over Putty so the keys are available on the command line and Vim for all of the Unix boxes I use. If you know of similar approaches in other OSes I'd love to hear it in the comments. Hope this is useful! Update: Amjith pointed me to XKeymacs, a tool that implements the same idea but for emacs keybindings (you could do a similar thing via AutoHotKey, but this is convenient for sure). Also, you guys in the comments are all in favor of Vim-style HJKL bindings, so if anyone makes a script to do that, I'd be happy to host it. Update 2: Simon Scarfe has posted Vim-like bindings for qwerty here. See the comments for details. Thanks! Update 3: Paul has posted a Linux implementation of this in a comment below. Sweet.